Instead of listening to the fatigue in your body do you continually try and do one more thing? Accepting your limitations and listening to your body are important for recovery. Stop pushing and start listening. Rest when you feel tired. Many people who develop ME/CFS had full, busy lives before their illness. As well as being a working mum of three I coordinated our village babysitting circle, and was a committee member for the after-school club my kids attended. Since my ME/CFS was sudden and severe, I had no choice whether to give up these commitments. For people who have a gradual onset, or milder symptoms there is a choice to be made. I urge you to chose your own health. If you find an activity draining, you dread it or it worsens your symptoms listen to your body and find a way to say “No”. If you are pushing yourself to do housework, then leave it. If you live with other people then they will need to step up and take responsibility for this. If you live alone ask friends and family to help you out. I had to learn to ignore the mess and dirt that I walked past in my house. I learned to lie on the sofa with the floor covered in my kids toys and not a) pick them up myself or b) use energy asking someone else (kids or husband) to do it. At the end of the day it’s not important. Learn to let it go. Perhaps you have a “helper” type of personality where you spend a lot of energy caring for others e.g. shopping for your Nan, picking up medicine for your elderly neighbour, always helping at PTA events (see commitments). If you’re a mum you will inevitably fall into this category. Most mums put their kids needs before their own. When you’re healthy it’s a wonderful feeling to help others, but when you’re ill you need to put your own health first. For you to recover you may need to disappoint those who you’ve been helping. Perhaps you’ve always been the friend who organises get togethers, or the mum who cooks Sunday lunch, or the son/daughter that visits your parents every Thursday evening, or the dad that helps with homework. Whatever it is, unless you are a hermit you will be able to think of things others expect of you. To recover you need to ignore others expectations and do what is right for you. If you look forward to helping with the homework, it makes you happy and doesn’t increase your symptoms then carry on. However, if your kids are whining that they need you, you’re dragging yourself off the sofa to try and help them, and then have to lie down to recover from the ordeal, it’s time to work out another way. Perhaps the other parent could take this role, perhaps there is a school homework club they could join, or perhaps they could do their homework with a friend and help each other. Change others expectations by changing your response – say no and let go. Others expectations will not change immediately. This one takes time and reinforcement by you. 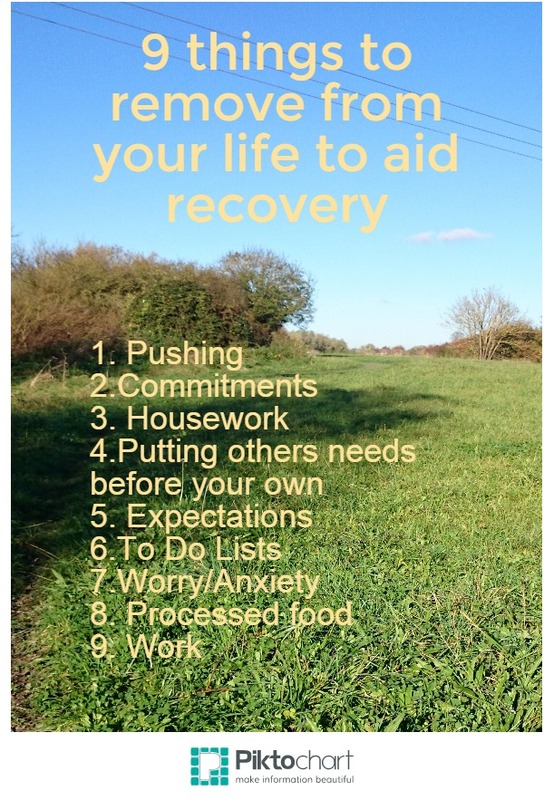 I love a good list, and now I’m almost fully recovered I have gone back to making lists. However, it was an important part of my recovery to stop making lists, stop taking responsibility for things and to let go. This meant many things didn’t get done at all, and many things got done slower than they would have done. However, I learned that the things on my list, which used to seem so important, are not important. For all the things that remain undone, I am fine and my family are fine. When we worry we activate our stress response (also known as fight or flight). In order to heal, our body needs to be in a relaxed state, so it’s important to change our thought patterns and relax our bodies. I found meditation really helpful for this. Processed food generally contains less nutrients than real, whole foods. For our bodies to heal it is important to have the correct nutrients. I accept that when you are not capable of cooking you need to take short cuts to feed yourself. Try to choose the least processed, most nutritious option you can. Prepared or frozen vegetables are a great way to get more vegetables in your diet when you can’t cook. I keep a bag or salad leaves in the fridge as an instant way to add greenery to my plate. Some people who are mildly affected with ME/CFS manage to work successfully. Some people (like me) have a sudden and severe onset and there is no question of whether they can work. I was dismissed from my job after being unable to work for 14 months. However, there are others who go back to work too soon, or struggle on with their symptoms getting worse and worse each week. If you’re one of these people, then you need to STOP. Pushing (see number 1) will only make you worse in the long run. You need to listen to your body. All the symptoms: the fatigue, the dizziness, the pain etc. are your body shouting at you to stop. It’s scary when you rely on your income, we all know benefits are hard to claim and do not offer the same level of income as a job. When you’ve got brain fog and you’re exhausted it’s hard to think of a way out, but you need to stop the cycle you’re in. I’ve seen a few people trying to hang on to jobs that they can’t really cope with. In most cases people’s symptoms get worse and worse, until eventually they are forced to stop working. Unfortunately by this stage their health is much worse and it is a longer, harder road to recovery. If your body is telling you to reduce or stop work then please listen to it. Great advice Sarah. I’ve pushed a lot recently with lots of fun stuff but also a few things I think I ought to do. So this is a great reminder to get back on recovery track – starting with an afternoon nap!